"Chocolate chips and coconut make delightful additions to this loaf of zucchini bread." Beat the eggs in a large bowl until frothy. Stir the vegetable oil, sugar, and zucchini into the eggs. Sift the flour, baking powder, baking soda, and salt together in a separate bowl; stir into the zucchini mixture until combined. 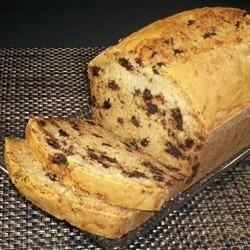 Fold the coconut and chocolate chips into the resulting mixture; pour into the prepared loaf pan. Bake in the preheated oven until a toothpick inserted into the center comes out clean, 45 to 50 minutes. Cool in the pans for 10 minutes before removing to cool completely on a wire rack. This bread is moist and delicious—great for a snack or dessert. I had a hard time cooking it thru and thru. Next time will cook in 2 loaf pans. Substituted whole wheat flour, healthy and fabulous. Love how the coconut mixes with the zucchini and chocolate flavors. Fantastic, yummy, simple...healthy and sweet! Great base recipe for more loaves! woohooo!